André Boainain Boainain is prize winner of a many major International Competitions such as Vienna Stepanov, Citta di Senigallia in Italy, Geneva International Competition in Switzeland, Paolo Neglia in Italy, Premio Jaen in Spain, William Capell in the US, Busoni International Competition in Italy. He has been recognized as one of the international pianists. Boainain was born in Sao-Paulo, Brazil. Graduated with Honor from Salzburg Mozarteum in Austria and Freiburg School of Music in Germany (also with Honors). Boainain studied with the world-renowned pianists such as Dieter Weber in Vienna College of Music, Hans Leygraf and Tatiana Nikolayeva at the Salzburg Mozarteum, Vitaly Margulis at the Freiburg College of Music. The musical style of Boainain is emotional expressiveness and a rich sound palaette. André Boainain is known as a concert pianist in France, Italy, Spain, Germany, Swtzeland, Scotland, England, Austria, Russia, Poland, US, Israel, Thailand, Japan, South Korea. The pianis has a lot of records in Germany Suedwestfunk. Switzeland Radio Suisse Romande, Austria ORF, England BBC, Italy RAI, Brazil TV Cultura and TV Globo. He has recorded solo and in chamber ensemble CD’s. The pianist participated in Music Festivals:Prokofieff Festival in St. Petersburg, Zelt Festival in Freiburg, Rosario Marciano in Vienna and in many festivals in South Korea. He also held masterclasses in Japan (Tokio, Kyoto, Osaka, Yokohama), Thailand (Bangkok), Brazil (Sao-Paulo, Rio de Janeiro) and in all major cities of South Korea. Boainain was a jury member of International and National Competitions in Vienna (Austria), Jaen(Spain), South Korea, Germany, and Brazil. Many students of professor Boainain are teaching in Music Academies in Essen, Karlsruhe, Trossingen, Saarbruecken (Germany), Tokyo National University, Mahidol University (Thailand), Pusan, Seoul (Korea). As well as in Hanover, London, Los Angeles, etc. Boainain is an outstanding teacher, having taught at Karlsruhe College of Music in Germany and as a guest professor at the Hamburg College of Music for three years. 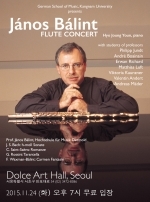 André Boainain is currently Professor of Piano at the German School of Music Weimar at Kangnam University. 오스트리아 잘츠부르크의 모짜르테움과 독일의 프라이부르크 음악대학을 졸업했다. 빈 국립음악대학의 디터 베버 교수, 모차르테움에서 한스 레이그라프와 타티아나 니콜라예바 교수를 그리고 프라이부르크 음악대학에서 비탈리예 마르굴리스 교수를 각각 사사했다. 이태리 시타 디 세니갈리아, 스위스 제네바 콩쿠르, 브라질 파올로 네글리아, 스페인 프레미오쟝, 미국 윌리암 카펠 그리고 이태리 부조니 등 다수의 국제 피아노 콩쿠르에 입상했다. 스위스 로망드 오케스트라, 독일 하이델베르크 오케스트라, 브라질 상 파올로 심포니 오케스트라, 스코트랜드 로얄 스코티쉬오케스트라 등과 협연했고 한국에서 유로 아시안 오케스트라, 경기 필하모니 오케스트라와 협연한 바 있다. 브라질, 미국, 이스라엘, 태국, 일본, 호주 등 세계 여러 나라에서 연주회를 가졌으며 독일, 이태리, 스페인을 위시한 유럽 여러 지역에서도 다양한 연주활동을 펴온 바 있다. 많은 CD음반을 녹음한 바 있으며 국제 유수 피아노 콩쿠르의 심사위원으로 참여한 경력을 동시에 지니고 있다. 독일 칼스루헤 국립음대 전임강사, 함부르크 음악대학 초빙교수를 역임한 바 있다. 현재 강남대 독일바이마르 음악학부 교수로 활동하고 있다.